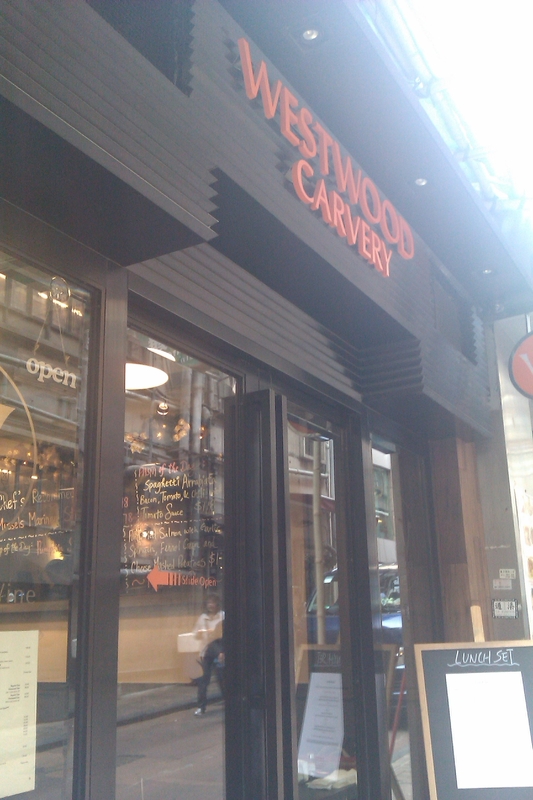 I’ve always been quite an observant person but to have let Westwood Carvery pass me by for the last 7 months is slightly ridiculous, seeing as I do saunter through LKF and past Wo On Lane on a regular basis. I finally found out about it through Facebook (ah the wonders of social networking), when a friend of mine started posting photos of his extra large prime rib sandwich from there and complaining about meat sweats. It’s no secret that I’m a bit of a carnivore, so I was determined to get myself down to this place as quickly as possible and show off my eating prowess (I like to challenge myself). My friend and I went for lunch and the first thing we noted was the cool and chic interior. It’s small but they have made good use of the space with their minimalistic decoration- grey slate tables and a clever looking wooden wine-rack wall acting as a centre piece. The menu is limited, but their set lunch starting from $98 to $148, comprises of a soup of the day to start, followed by a choice of either their signature prime rib sandwich with fries, pasta or fish. Coffee and tea is served at the end and for an extra $20, you can have a dessert- good value! 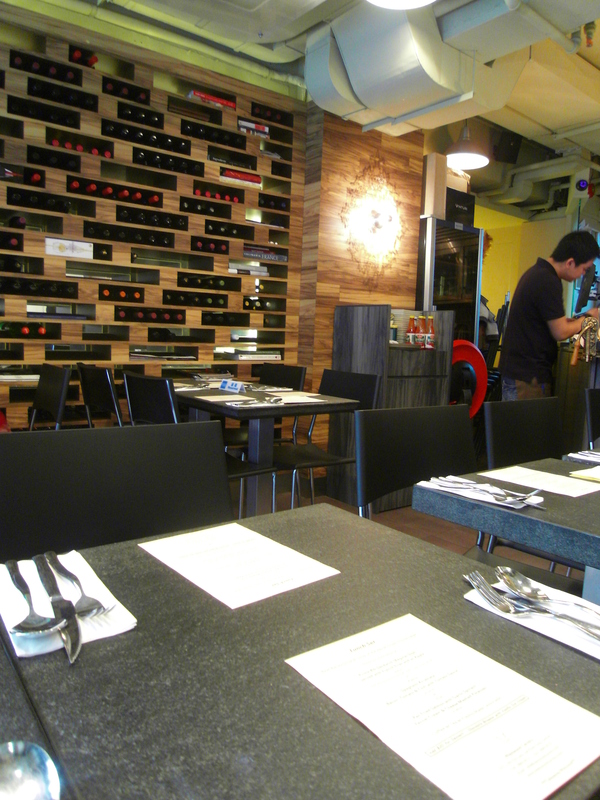 On the a la carte, they have salads, pastas, their prime rib sandwiches, pork ribs and a few side dishes on offer. 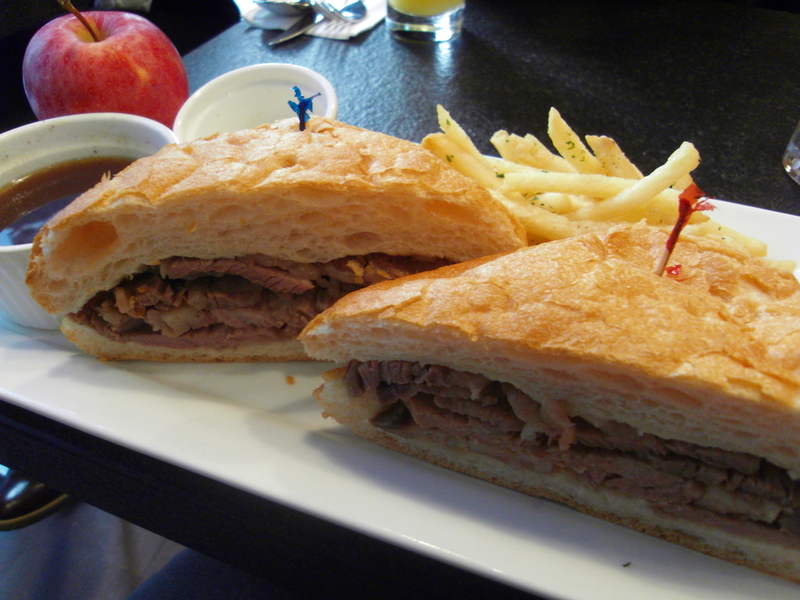 But it is their roasted prime rib sandwich that is the star of the Westwood Carvery and the whole point of their name. It comes in two sizes: regular ($78) or Westwood size ($98). For comparison’s sake, this would be akin to a regular sized box of Kleenex tissues versus Kleenex tissue for men! The sandwiches are served au jus with fries, a ramekin of horseradish sauce and an apple on the side to trick you into thinking you’re being healthy. The regular size is for sensible people, the Westwood for the greedy, gluttonous, brave and bold types like myself, who enjoy self-competition. I did check with the friendly manager first if I could manage, and she said she eats a lot and can cope, so I took that as a sign that I could too! My friend was being dainty and lady-like so opted for the regular with an extra helping of fried onions while I rubbed my hands in anticipation for my Westwood sandwich. It did not disappoint. My sandwich was huge and I was a happy bunny. The men at the table next to me looked on in disgust as I merrily dunked my sandwich in the jus, smothered each mouthful with horseradish sauce and tomato ketchup and crammed it into my mouth. 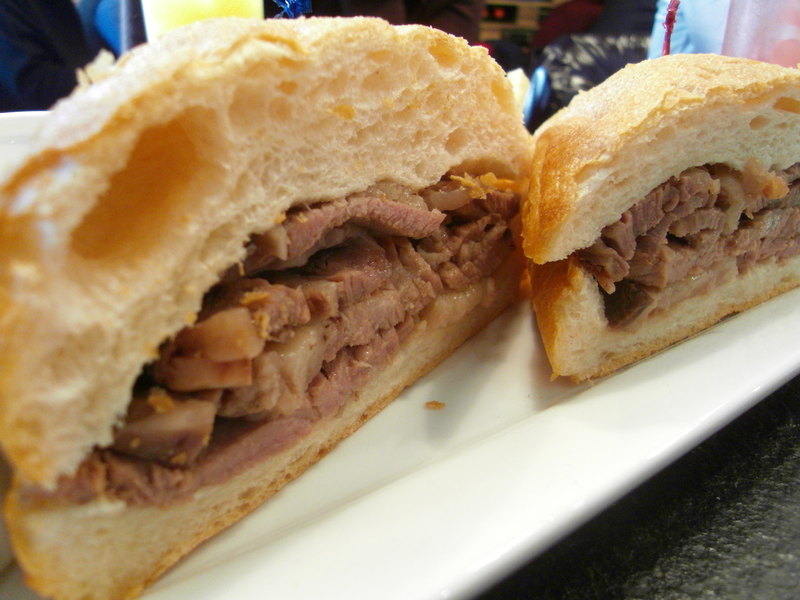 Tender slices of beef on soft yet crusty bread drenched in gravy- what’s not to love? In 20 minutes, it was all gone, including the apple. A clean plate and I still had room for a coffee. Piece of cake. Bliss for the foodie. Categories: American, Sassy Hong Kong | Tags: au jus, Central Hong Kong, Hong Kong, horseradish sauce, Lan Kwai Fong, prime rib sandwich, Sassy Hong Kong, Westwood Carvery, Wo On Lane | Permalink. With only 3 days to go till Christmas, I don’t think I’m the only one wondering where on earth 2010 went?! When I started Chopstixfix earlier this year, I really had no specific goal in mind except to write about my food adventures and share my love of eating with friends. I’ve been so grateful for all those who’ve read my entries and to those who follow my blog regularly, and it has given me immense joy to hear people trying out new places because of something I’ve written! So, it has been the absolute icing on the cake for me to end this tumultous and frankly, totally mad year, with the start of a collaboration with the girls at Sassy Hong Kong, (a website dedicated to helping girls get together, make friends and unearth the wonders of Hong Kong!) who have amazingly welcomed me to their team to help them with their Food section. Thank you Sassy girls! Check out my introduction from Sassy and my first review for them- Paisano’s pizzeria! 2011 will be an exciting year for us, so watch this space! Merry Christmas and a very Happy New Year everyone! PS- My new year’s resolution is to be a lot more regular with my blog posts- I know I keep saying this, but I promise there will be more to read with your morning coffee from now on!! Categories: About, Sassy Hong Kong | Tags: Chopstixfix, Sassy Hong Kong | Permalink.